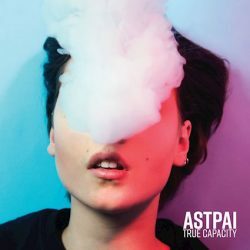 Austrian melodic-punks ASTPAI release their sixth album, True Capacity, on 22nd June via Jump Start Records (US) / Shield Recordings (EU). Speaking on the record, vocalist, Zock said, “When re-reading all the lyrics before recording, the word that stuck out the most is the word ‘mind’ – I feel like the older I get, the less my brain/mind/sanity/happiness manages to catch up and adjust to the ongoing impact of both useful and useless information – I’ve been going through really dark and intense phases of feeling absolutely full…you know, like a hard drive that reached its limit. “The term “True capacity” is used to describe the maximum limit of production of (industrial) machines. I like the thought of using this term, comparing the way that it describes the capabilities of something soulless like a machine and the human brain/mind. The artwork underlines this idea in the way that our brains and emotions are unable to compute all the information we’re given. Daantje Bons really hit the nail on the head with her amazing cover photo. True Capacity has seen ASTPAI team up with Tom Zwanzger at S.T.R.E.S.S Studios, Graz for engineering and production. The band also enlisted close friend Chris Cresswell of The Flatliners for vocal production. The record was mixed by J Robbins at Magpie Cage, Baltimore USA and mastered by Dan Coutant at Sun Room Audio, Cornwall NY USA. After a short break in 2017, the band sound fresh and invigorated on True Capacity. There’s an UK punk sound at the heart of ASTPAI, think of the insatiable melodies and punk grit of bands like Bear Trade, Bangers and Great Cynics and you’ll be on the money. As such, this is a record that has a familiar and welcome sound yet has enough live and ingenuity to sound new and full blooded. Tracks like ‘Lottery’, ‘Fallen Trees’ and ‘No Hero’ are absolute bangers that you’ll want to listen to on repeat while tracks like ‘Rotten Bait’ show a more mainstream side with hints of pop rock coming to the fore. The simmering rage of title track ‘True Capacity’ is enthralling and you can’t help but dance along to ‘Saving Up’ before ‘Wear and Tear’ blows everything else out of the water, not only the standout track of the album but one of the best punk rock tracks you’ll hear this year.